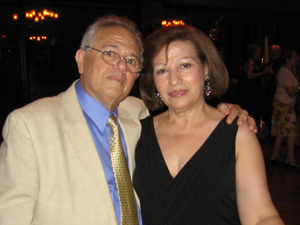 Gaetano’s surgery was in May 2010, “a textbook pleurectomy,” she said, “with removal of his diaphragm and the sac around his heart.” While the surgery went well, his recovery has been complicated, including blood clots, recurring infections, and wounds that would not heal. Support, in fact, comes from around the world. The Formicas have met many people in similar circumstances during their stays in Boston for care, both in the hospital and at the Thornton & Naumes House. “We keep in touch with families, including people in Greece who invited us to come to visit,” she said. Support goes both ways, and the Formicas give as well as receive. “We met a couple from Italy – the husband is a cardiac surgeon and his wife, the patient. I helped out as a volunteer translator for them during their medical visits and my husband has continued the friendship he built with the surgeon,” she added.